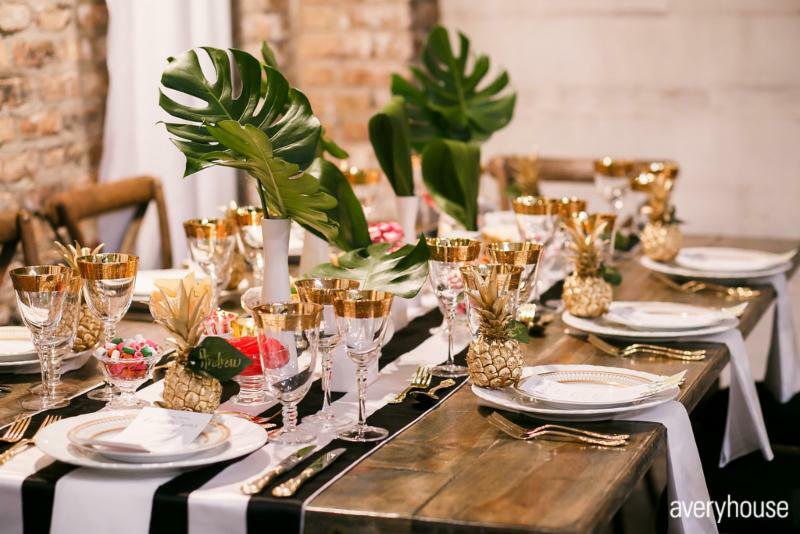 We kick off this year's Guest Designer series dreaming of warmth and sunshine with a creation by Rachel De Marte of Rachel De Marte Plan l Style l Party. 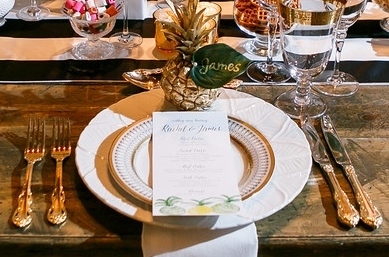 With so much zest and creativity, she couldn't settle on just one title for her table design so she chose two: Resort Chic aka Pineapple Express. 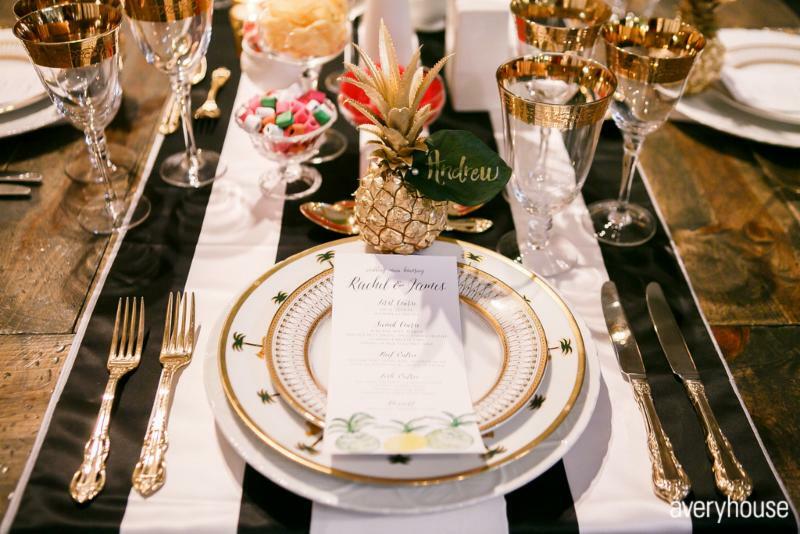 Everything we discussed on that blustery winter day when she created her table seemed to evoke the tropics: Specifically Mexico where Rachel was headed the next day to prepare for an upcoming destination wedding. Catherine Fitzpatrick, owner of Charm Studio and calligrapher of the place cards, designed the menu cards the week prior while she was vacationing on a Mexican beach. 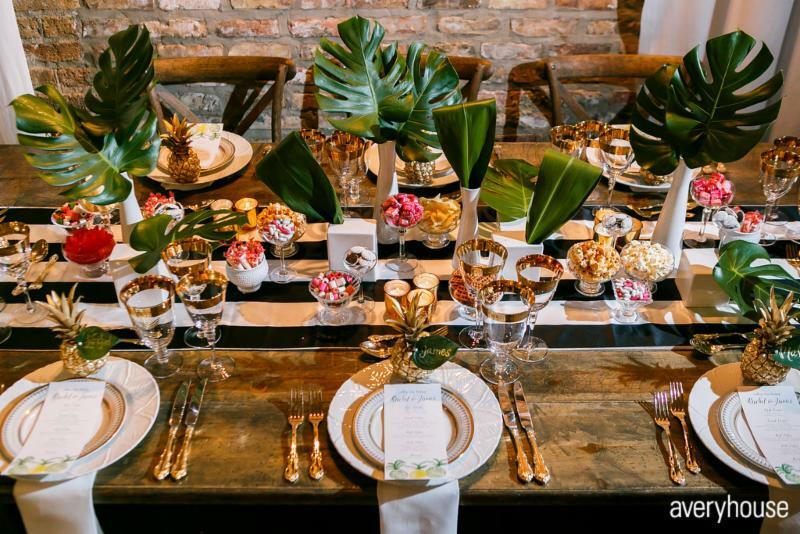 So what in Tablescapes' showroom provided the impetus for the tropical theme? 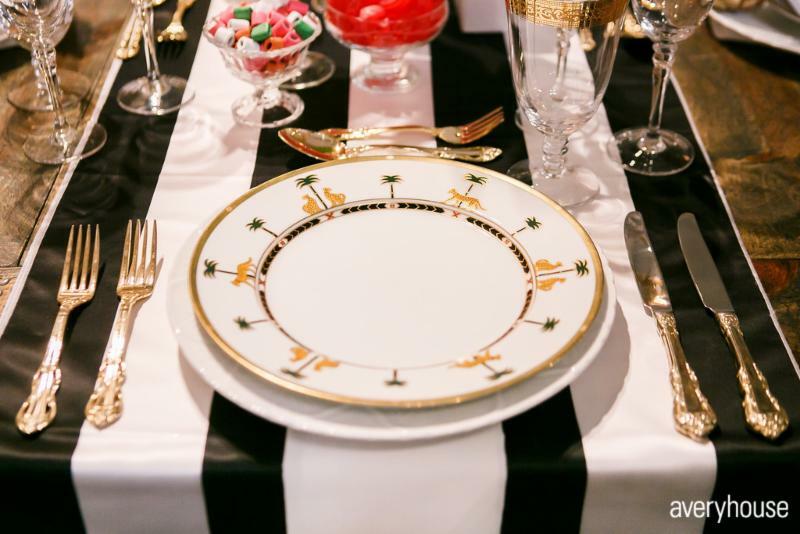 Our Christian Dior Casablanca plate (now in limited numbers) with the palm trees. However, the Casablanca plate in this tableau shows how design ideas can morph and evolve. Layer # 1 - Casablanca was placed on top of the White Textured Leaf Charger. The Leaf Charger added not only another layer of texture but the subliminal imagery of more greenery. Layer # 2 -- The next layer was our Gold Gothic Salad Plate. Rachel said "Gold ups the ante, especially for the Mexican theme." 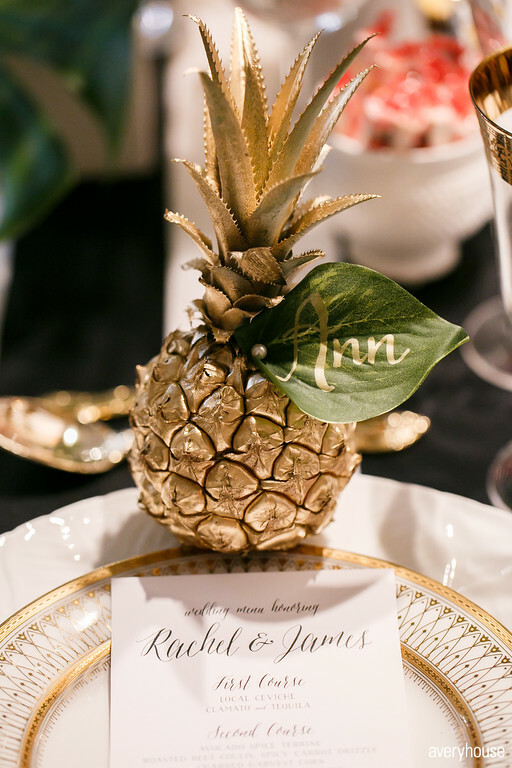 Layer #3 -- When the perfect gold pineapple place card and the menu card are added, the whole effect turned out to be way too busy. To paraphrase Coco Chanel, "Before you leave the house, look in the mirror and take at least one thing off." Rachel knew this and off came Casablanca. Her way of making Coco's point is "...too much starts to dilute what you are going for". The final design had just the right amount of gold to feel luxurious juxtaposed against the roughness of the Aged Farm Table. 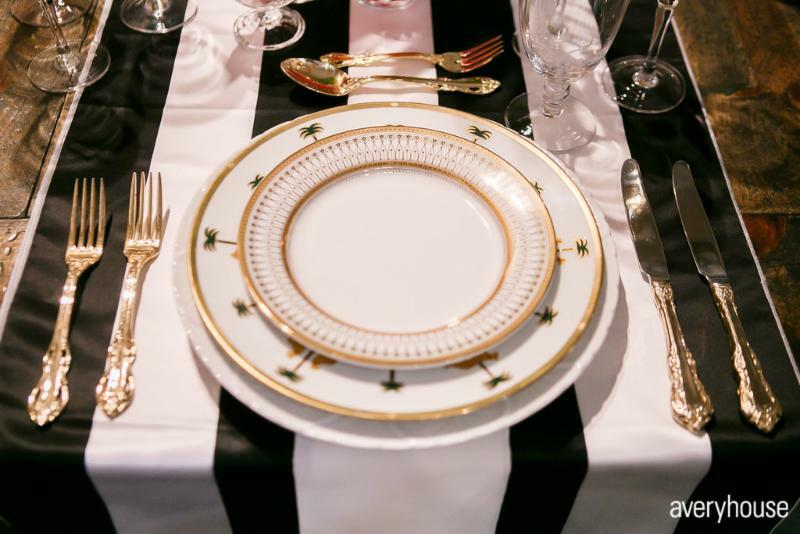 The black and white table runner definitely evokes striped cabanas from a four star resort somewhere in the sun. Rachel likes to call her designs "foodcentric" using edible décor and continues the layering with food in the centerpiece. Even here, with the challenge of leaving the display in place for a whole month, she added colorful non-perishable snacks to add playfulness and "munchies" for the Pineapple Express part of the theme. Potato chips in our Cocktail Coupe glasses? We have never seen that before! Rachel's tip: "Design is a process. Bring extra objects (and rental items) to play with and build each centerpiece or buffet layer by layer." The centerpiece looked bountiful with an assortment of vessels and even includes mini vessels filled with snacks. 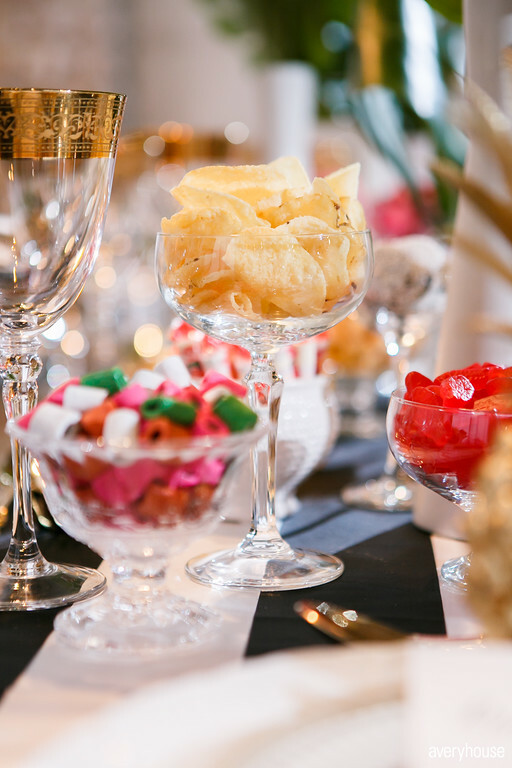 Our new Mini Crystal Champagne Saucer is prominently featured. 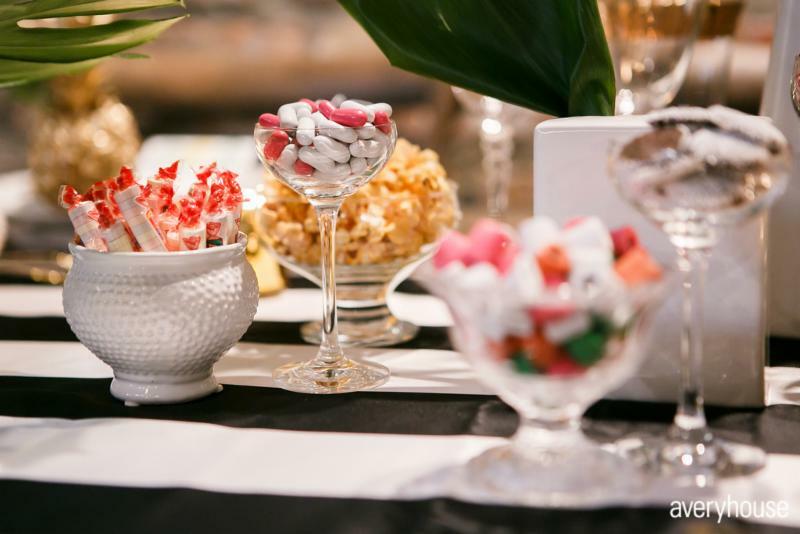 According to Rachel, one way to make off-premise events feel as personal as home parties, use different shaped tables with different centerpieces mixing the same layered edible elements. It encourages the guests to nibble and feel right at home. Rachel specializes in social events at venues and in clients' homes. When doing residential events, she styles the whole home. Lighting is key and Vanessa Wheeler of Averyhouse, this month's photographer, agrees. For example, Rachel will set the lights in a home in anticipation of the event and then, just before guests arrive, she will go around the whole house again for a final adjustment as the evening light changes. Check out each of the ladies' websites for more creative ideas. And look for more exciting news from Rachel and her husband/Chef James De Marte. They are opening their first restaurant together, Mariuccia in the West Loop.